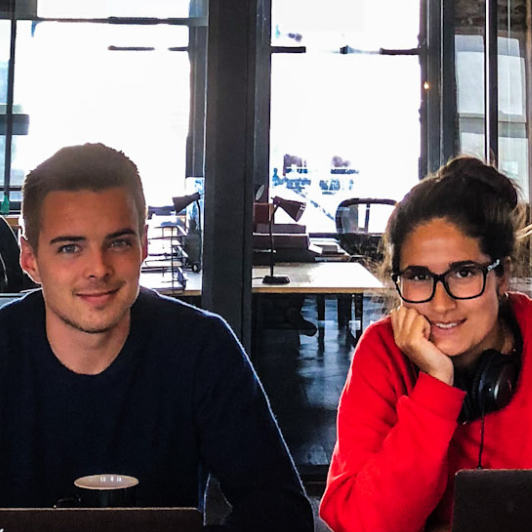 We are Loke Hegge and Kahni Ismail, two Norwegian Business students spending this summer interning at Jirav in San Francisco. Our first project was to make two demo accounts that could be used for demoing for customers and making tutorial videos. In this post we will show you the final outputs and then walk you through how we built them. Our first demo company is Tembo Electronics. It is a late stage IOT company that primarily sells a hardware product with software subscriptions. Their main product is an advanced camera for monitoring of indoor spaces. They sell a subscription that provides value added services built on top of the camera. In addition, they also sell other hardware accessories that add to the ecosystem. They have both residential and commercial customers. The second demo company is Simba Software. It is a seed stage Software as a Service (SaaS) company. It specializes in sales performance reporting and customer management for Small to Medium Businesses (SMBs). They sell a single product with varying feature sets, different billing frequencies and contract lengths. They also charge one time setup fees when selling new licenses. The dashboards below show the two companies at a glance. We can see their differences in size in terms of revenue, headcount, salary run rates etc and the specific KPIs for each that we are tracking individually. The charts also show how the Actual numbers for these companies compare to the Budget that was allocated for that time period. This helps to easily guage how the companies are doing, and how they are tracking against their own plans. 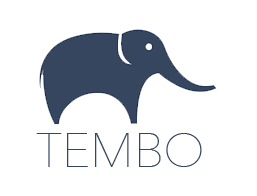 Tembo has $5.9M in the bank with monthly Operating Expenses around $300k. The Customer Acquisition Cost (CAC) vs Lifetime Value (LTV) shows a healthy trend, with CAC slowly edging down as LTV edges up. The Salary Run Rate is slightly lower than the goal. Simba has $750k in the bank with a monthly burn of $240k. The monthly user growth is going better than planned, while we are short on our headcount budget of 18. The cash line on the income statement shows we plan to raise some funds in Jan 2019. Jirav lets us configure an Executive Summary report that can be tailored to reflect the unique aspects of a specific business. 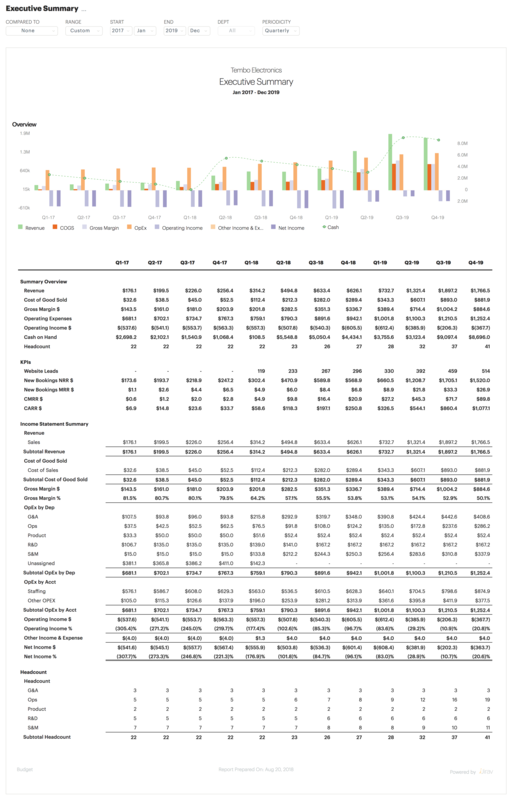 It shows a quick graphical snapshot of the company, followed by a summary that combines financial and non-financial information seamlessly, key KPIs, a mini Income Statement that abstracts out all the detail in the full reports, and a headcount summary. This is a very powerful and comprehensive view of a company. At a glance, it tells us all the key information we need to understand how a company is doing and where it plans to be. 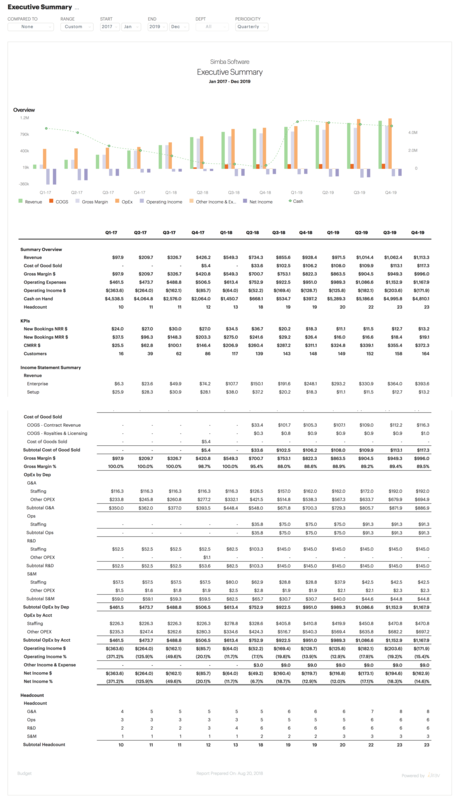 The executive summary for Tembo below shows the entire 4 year planning period aggregated by quarter. We can see that Tembo had a fundraising event in Q2 18, which is when the cash went up. We can see the next fundraising event is planned for Q3 19, just after revenue is expected to trend up more. We can also see the seasonality in the business reflected in the relative dips of every Q4. The COGS keep increasing with revenue, and that's an area where improvements can help increase the net income. The executive summary for Simba below shows the entire 4 year planning period aggregated by quarter. Q1 of 2018 is where the revenue starts to go up and we maintain a healthy increase in expenses to sustain the growth with a plan to raise a $5M round next year. We create some demo accounting data for both the companies. For Tembo we use Quickbooks Online and for Simba we use Xero. The staffing data is created in Gusto’s standard summary report format. The Customer data for the company's sales is in Salesforce format. All of these are imported into Jirav using the Actuals import workflow. The revenue build is done using the Plans area in Jirav. We define the customer segments, if any. Then we define the list of products with their own billing freq, list price revenue types, revenue recognition terms, revenue recognition delays etc. Then assumptions are made on how new bookings for the products come about, how they grow and their effect on the revenue. Tembo Electronics has two customer segments, Residential and Commercial. Residential customers buy their products for home use while the commercial users are buying it for their facilities. Tembo has several hardware products like Tembo Camera, Tembo Lock, Tembo Doorbell etc. These are all Non-Recurring Revenue (NRR) products as they are mainly purchased one time and paid for upfront. In addition there are two App Subscriptions that have a Monthly Recurring Revenue (MRR) component. One of them is paid every month and the revenue is recognized in the same month. The other one is pre-paid for the year but the revenue is recognized over a 12 month period. We then use a basket of goods to model the mix of products that a typical customer buys. We can change those assumptions by year to account for market trends and adoption changes within each segment. For example, we assume that in 2019, a typical commercial customer will buy 140 NRR products, 30 monthly subscriptions and 50 annual subscriptions. We then make an assumption that the commercial sales will be done by a sales team. So first we assign a quota indicating how many commercial customers a salesperson can bring each year. Then we assign a ramp-up that shows that a typical sales person becomes 100% productive 7 months after their hire date. The Seasonality assumption shows that business is slow in the beginning of the year, but that it picks up in June, July and August and then stabilize throughout the year with a slight dip in Sep & Oct.
We then add salespeople to our staffing plan, assuming we hire a new salesperson every 3 months. Marking them as quota bearing makes them start driving commercial sales in the model, from their respective date of hire, taking into account the ramp up time, seasonality and quota attainment goals. We drive the sales for our residential customers by dividing our monthly Advertising spend with our expected Customer Acquisition Cost (CAC). The Ad spend becomes an input here, and we can tweak it to match our budget and our sales goals. The CAC here is an assumption for the future and it can also be compared with the historical CAC to check how well we are tracking it. Behind the scenes, Jirav’s billings and revenue recognition engine translates these bookings into the proper cash transactions and revenue recognition schedules giving us the final Revenue numbers. Simba Software sells to other businesses only and they are segmented by their size: Small, Medium, Large. Simba offers five different subscriptions to their customers which bring Monthly Recurring Revenue (MRR). In addition, they also charge a one-time setup fee which we mark as Non-Recurring Revenue (NRR). To model their sales, we assume there are different Customer Acquisition Costs (CACs) associated with each product variant that they sell. We take the advertising spend and divide it by the different CAC values to drive the bookings of each product. E.g. the first line below says that a New Booking of the Pro Annual product is driven by the Advertising spend divided by the CAC for the Pro Annual (CAC PA) product. Additionally, the last 4 lines call out that associated with each MRR booking for a subscription, there is also a one-time NRR Setup revenue. We then go to the Staffing area to review the current org chart and plan the future hires. Tembo Electronics starts out with a headcount of 22 existing employees. We add sales people using a periodic change driver, 1 new sales person every 3 months. Support staff is added as a function of customer growth with 1 new support staff for each 700 customers. 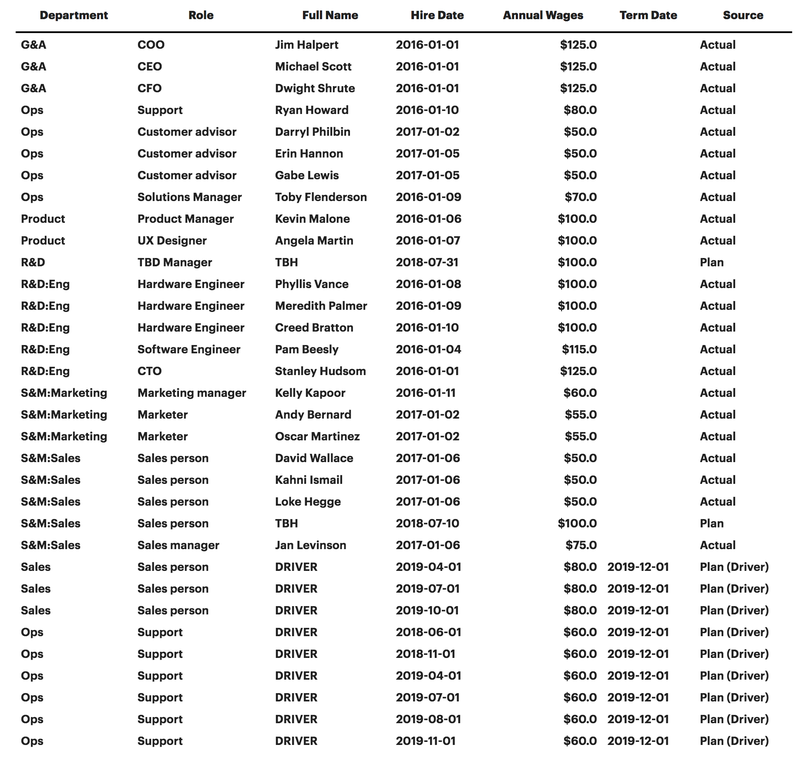 Additionally, we also add in some ad-hoc people that we know we plan to hire over the next couple of years. 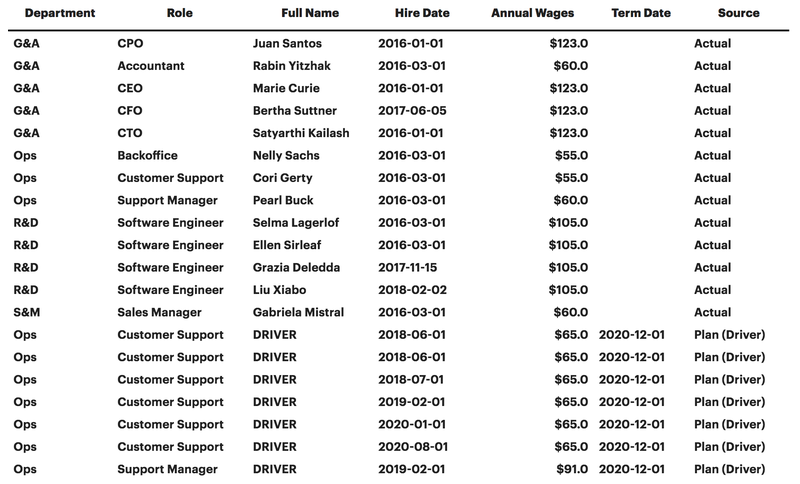 All of these individually planned and driver-based hires are included seamlessly into the workforce report alongside the existing staff. As time progresses and we hire actual people, they are automatically removed from the projected hires to maintain the capacity goals we have set. For Simba there are two types of positions that are filled using drivers. A marketing manager is hired for every 4 marketing associates. A support person is hired for every 50 customers. Similarly, we also add in some ad-hoc positions based on our growth plans. Now we head over to Cost of Goods Sold (COGS) and Operating Expenses (OpEx) to model in all other expenses for the companies. These are quite similar across the two companies with some minor differences. 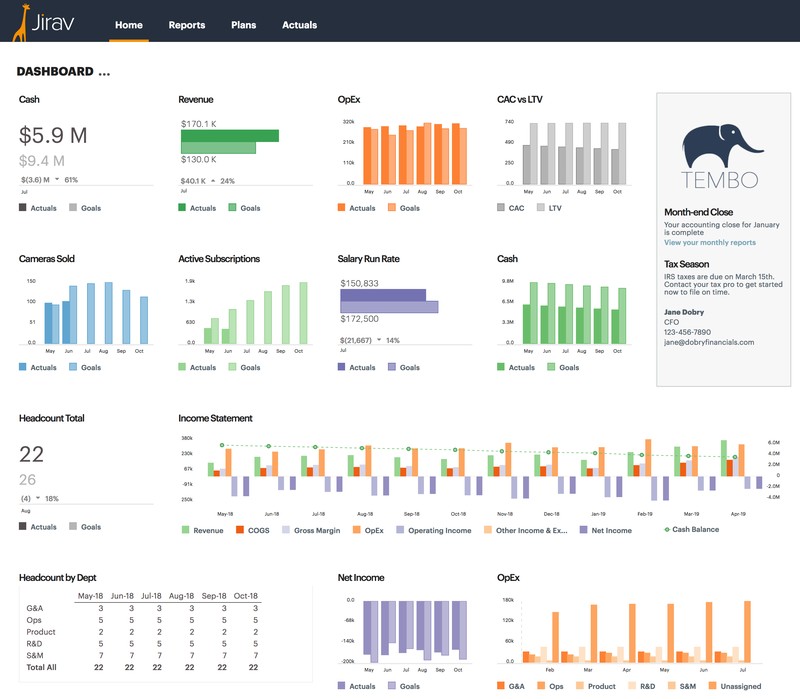 The COGS for Tembo depend both on the cost of manufacturing the hardware as well as the hosting expenses for the software subscriptions they sell. The OpEx for Tembo includes standard expenses like Employee Benefits, Insurance, Office Expenses, Rent, Meals & Entertainment, Bonuses etc. Most of these are driven as a function of headcount. The advertising expense is a top down assumption that drives sales, and all other expenses. We initially book all expenses to the G&A department, and then we allocate it out to each individual department as a function of their headcount ratio. The COGS for Simba are mainly the hosting costs associated with the software licenses they sell. There's another cost associated with the transactions users make within the product that is paid to a 3rd party gateway. 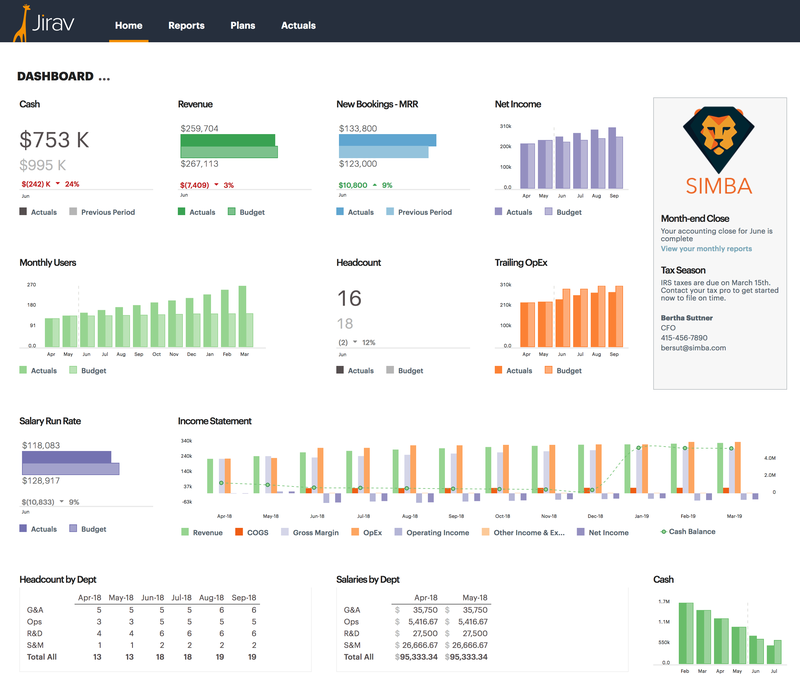 The OpEx for Simba is similar to that for Tembo, most of it driven by headcount. The rent is split into two drivers as we expect to move offices to a more expensive location in 2018. And the advertising expense is similarly a top-down assumption that drives all their sales and the rest of the model. Finally, we dial in the fundraising assumptions to show what we can achieve with different cash situations. 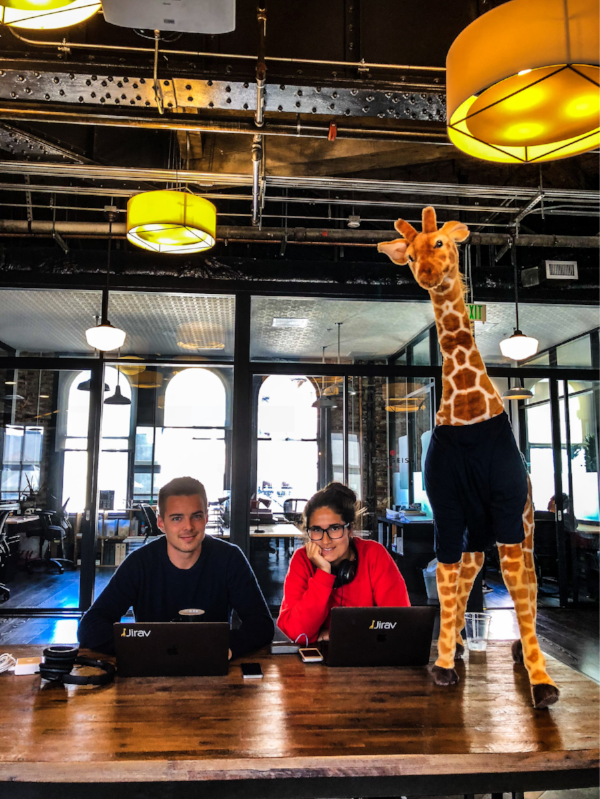 If things go as planned, Tembo plans to raise another $6M in Q2 of 2019, which gives them the cover to continue executing on their growth. We can add that assumption into the Equity section of the plan. Jirav takes care of making Cash goes up as well, ensuring that the Balance Sheet is always balanced. Simba, on the other hand, raises plans to raise a $5M round in Jan of 2019. We can see again, side by side, the Income Statement charts for the 4yr period that we are modeling for these two companies. They tell a story of two companies with different business models, different stages of growth and different levels of fundraising. We can very easily change any of the assumptions in our model and these charts update instantaneously, making it a very tight feedback loop. This really helps strategic discussions as scenarios can be tested on the fly. Once we have consensus on a plan, we can lock down our budget as a Plan of Record. This freezes the plan and all the Actuals that were used to make that plan. It becomes the reference that is then used to track future growth and for re-forecasting. Hopefully, this demonstrates how customizable the platform is while still being simple to use. This makes it easy to collaborate with others and keep everyone on the same page. We had a lot of fun making up these two companies and then modeling them on the Jirav platform. It was very easy and straightforward and we ended up learning a lot about financial modeling in the process.